Our 100% pure Korean Panax Ginseng is free of extraneous fillers, binders, artificial ingredients, potentially harmful preservatives or GMOs. Our supplements are always formulated in GMP compliant facilities, subjected to stringent third party purity testing, and made in the USA. Not all Panax Ginseng is the same! Ginsenosides are the active ingredient in ginseng. Ginseng supplements that contain little or no ginsenosides may not be effective. aSquared Nutrition sources only the finest quality ginseng available in Asia and then uses a high potency 4:1 extract concentration ratio to ensure high potency ginsenosides are present. 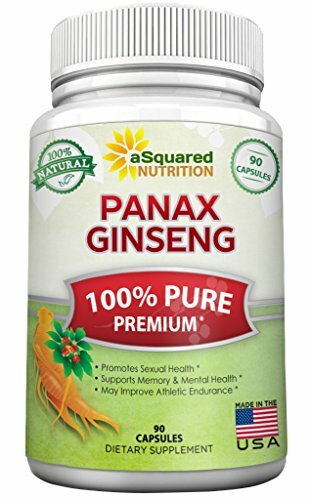 A Bit More Information on Panax Ginseng: Panax Ginseng should not be confused with American or Siberian ginseng, which are entirely different plants. High quality ginseng must use plants that are at least 5 years old to ensure high potency – so beware of inferior ginseng products! *The results described are not typical and will vary based on a variety of factors. Results may vary. *These statements have not been evaluated by the Food and Drug Administration.